When purchasing any older diesel the very first phase of restoration should be the evaluation of the internal condition of the engine. If you are wondering why I am starting here let me explain. 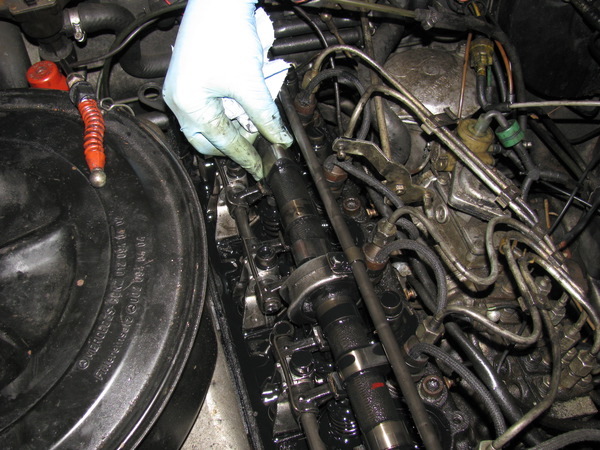 In any old Mercedes diesel, the engine is the most important and valuable asset of the vehicle. In many cases the value of the engine can be more than what an owner paid for the entire car. Properly rebuilding a diesel engine can range anywhere from $4000 to $8000 (and up) if you have it professionally done. That has proven to be a real shock to many who are faced with a dying engine. We regularly receive emails from our customers who have spent hundreds of dollars on their Benz only to find out later that the engine is worn out. I know the temptation. After spending weeks or months searching, you find and acquire your diesel and are immediately inspired to fix all the cosmetic and minor mechanical flaws. Then winter comes and the temperature drops. You discover the engine is very slow to start on those cold mornings. You decide take it in to your local shop for a check up. When the report comes back you are shocked and dismayed to learn your engine needs a complete rebuild. This happens more often than you would think. 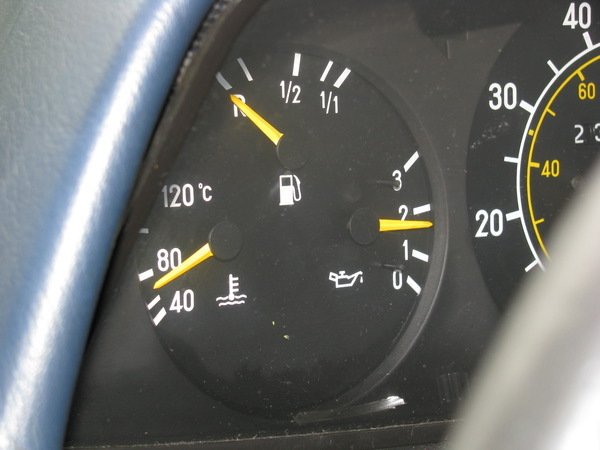 Avoid the temptation to put ANY money in your diesel until you determine the condition of the engine. In some cases what you find will encourage you to immediately sell the car and look for another. 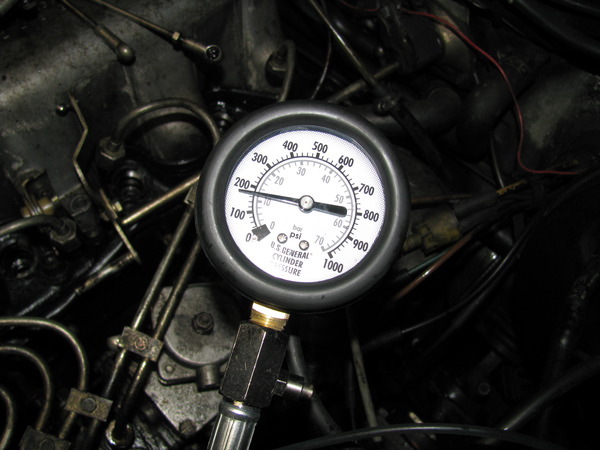 There are a number of things you can do to help you evaluate your engines health. Sight, sound and smell can all help, but the single most important inspection item is a cranking compression test when the engine is cold. Diesel engines require very high compression to heat and ignite the diesel fuel properly. When the piston rings and cylinder walls wear, the compression will drop resulting in poor starting, loss of power, excess fuel consumption and poor fuel economy. AND there is NO quick easy fix for this condition. You can not just -throw in a set of piston rings - like you could on a gas engine. A lasting fix will require complete disassembly of the engine - installation of new pistons and/or cylinder wall liners and rings - as well as bearings, gaskets, head rebuild, etc. 2. Condition of air filter. 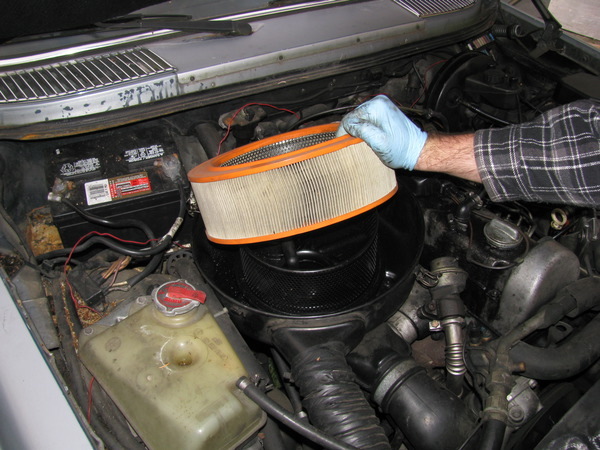 A visual inspection of the air filter and air filter housing can give you a good idea of just how much blow by the engine is producing. 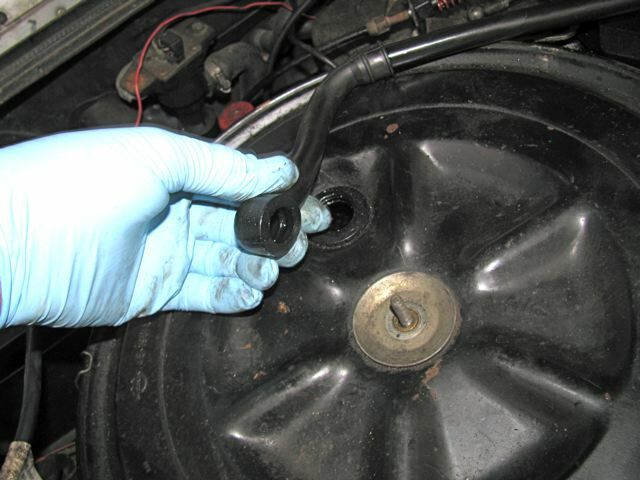 Excessive crankcase blow by will blow oil into the air filter and housing and will show up as a oily filter element or oil pooling in the metal housing. This does not necessarily mean your engine is toast, but it is another important gauge of its overall condition and expected life. On this engine the air filter was free of oil and the housing only had minor oil staining. Another good sign. Amount of crankcase pressure (blow-by) pressure at breather. 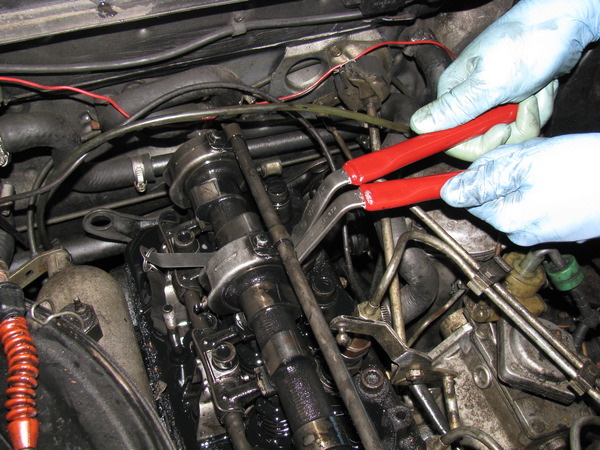 All older diesels will have some blow-by so do not panic if you find yours does. It is the amount and coloring of the blow-by that you must look at closely. My manual Diesel Performance and Tuning goes into this in more detail and will expain another test you can do. If it is blowing a hurricane out of the tube (when removed from the air filter) and/ or the color is smokey grey then you may have a problem! On this engine only average clean blow by was found for an engine of this age. One more encouraging sign. On the next installment I will post the results of the valve adjustment and compression test. Then it was time to hook up the compression tester. Injectors were removed and inspected. Only minimal tip wear on the injector nozzles was noted. Compression tester hooked up to 1 cylinder and engine cranked over with starter. Glow plugs and fuel source plugged off for engine cranking. Whoops.... Compression only came up to 180 pounds on the gauge. There must be some thing wrong with the gauge!. So we hooked up the compression tester to #2 cylinder and cranked again. Compression came right up to 365 pounds. Now I was beginning to worry. Checked valve clearances again on No. 1 and redid cranking compression test. Once again compression only came up to 180 pounds. Ughh. This is not an acceptable reading. Remaining cylinders tested and all checked out at 350 to 375 pounds (now that is acceptable!). Note: The compression tester we offer for sale comes with my manual of how to read compression test results. Final decision: Engine will have to go . 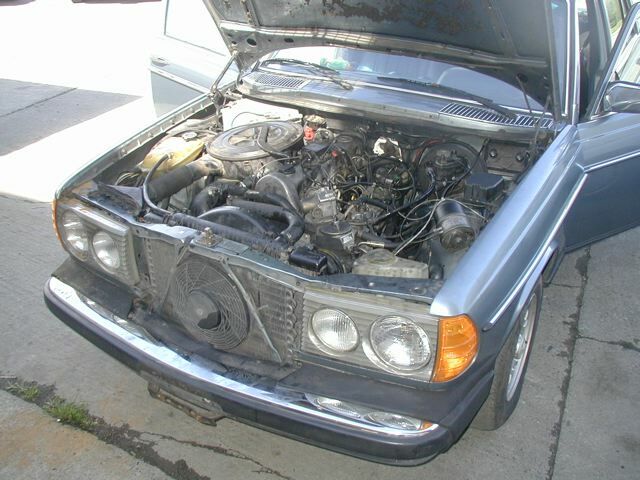 I will transplant another good used engine from a 1985 300SD. Before pulling this SD engine, I had good opportunity to run the engine and drive the car (minor rear end accident), With less than 120,000 miles it is one of the better used engines I have come across. Since this engine is out of a 126 chassis it will not be a direct drop in. There will be a number of things I will have to swap out before installation. I will go over these in the engine restoration section. Click on the ENGINE RESTORATION / TRANSPLANT link below to see how I am going to handle this transplant. For those of you faced with the prospect of purchasing a diesel or who have just purchased one I would highly recommend you do a complete engine physical exam. I have put together a PHYSICAL EXAM KIT for 615 616 and 617 four and five cylinder diesel engines. This kit includes everything you will need to do this important exam yourself.